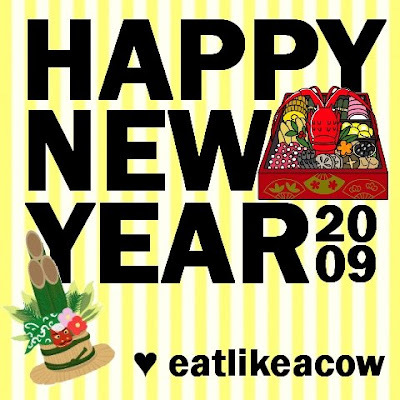 eat like a cow: Happy New Year 2009! Happy new year, everyone! Thanks for visiting and reading our blog in 2008.
and Moo Moo (San Diego)!! Happy New Year ^^! Wow what time did u go to circ quay cos you got a pretty good spot. Happy eating in 2009! Ahh nvm I just read the previous post. Yeah all the good spots you need to go heaps early and I am way too cbb. I have seen people camping at some spots the night b4 :S too crazy for me. Great bentous tho and you should make them again haha!